Do you smoke? Then share this via social media icons below this post. NOTE: An earlier version of this post referred to LB438 as LB448. In 2012, the most impoverished of nicotine-addicted New Yorkers spent 25% of their income on tobacco. Apparently Senator Howard would like to see that happen in Nebraska. Her new bill, LB438, would more than triple cigarette excise taxes paid by the state's 240,000 adult smokers (a rise to $2.14 per pack from 65 cents). LB438 is extremely regressive and sharply at variance with Howard's posture as a champion of the downtrodden. Poor people, for various reasons, (stress, perhaps?) have a much tougher time kicking butts than do the wealthy. The excuse for raids on the wallets of smokers is always the same: a) discouraging young people from taking up the habit (Howard obviously cares not a whit about the collateral economic damage to adults) and b) covering the supposed extra health care costs incurred by smokers. An inconvenient truth for Senator Howard is that smokers probably cost society less money on their way to the grave than nonsmokers. 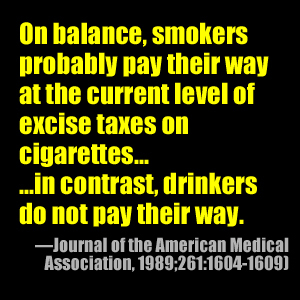 In 1989—even before cigarette taxes became as stratospheric as they now are—JAMA, the Journal of the American Medical Association, published a study on sin taxes, and found that it was drinkers, not smokers who didn't pay their own way. Remember the S-CHIP program for children and its later extension that Hillary Clinton took credit for (even though Ted Kennedy did the heaving lifting for the 1997 original, before Hillary took her Senate seat)? Well guess what? It cost smokers—and only smokers—in Hillary's village a total of 90 billion bucks and not a dime was spent toward smoking cessation. Because smokers die on average 14 years earlier (claims the CDC), they leave a lot of Social Security, Medicare and pension money on the table for nonsmokers, as well as dozens and dozens of billions in tobacco taxes every year! Frequently, smokers die cheaper (not just earlier) than nonsmokers: fewer of them perish from that most expensive fatal illness of all, Medicare budget-busting Alzheimers (smokers don't live long enough to be afflicted as often as nonsmokers.) Smokers are have more heart attacks, and since at least 1/3 of heart attack victims die when first stricken, and dropping dead of heart failure on the first try is a relatively cheap way to go, smokers save society even more money! You'd think Sen. Howard would be grateful to smokers! Alas, she just wants to shaft them more. bill to make you pay $545 more per year in taxes? She said 31.6 percent of Nebraskans who earn less than $15,000 a year are smokers. Additionally, Fox said, the cigarette tax is a relatively unreliable source of funding. “If Nebraska is to rely on this tax to fund necessary services for the state’s most vulnerable populations, it will create long-term funding shortfalls that will have to be paid for with other budget revenues,” she said.